MUMBAI (Scrap Register): India major brass and copper scrap prices advanced on Friday, while copper futures prices at India's Multi Commodity Exchange settled down as the dollar soared to a 13-1/2-year high after Federal Reserve Chair Janet Yellen signaled U.S. interest rates could rise relatively soon. 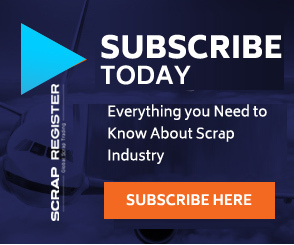 The major brass and copper scrap commodities on the Scrap Register Price Index traded higher on Friday. The major brass and copper scrap commodities like brass huny scrap, brass sheet cuttings, brass shell 40mm, brass utensil scrap, copper cable scrap, copper mixed scrap, copper pat, copper super d.rod, copper utensil scrap and copper wire scrap traded up during the day. The most active November copper contract on the India's Multi Commodity Exchange settled slightly lower by 0.429% to Rs. 371.100 per kilogram on Friday from previous close of Rs. 372.70 per kilogram. Copper futures at MCX touched and intra-day high of Rs. 374.35 per kilogram and an intra-day low of Rs. 367.70 per kilogram during Friday. Trump's election as U.S. president has done nothing to change the Fed's plans for a rate increase "relatively soon," Yellen said on Thursday, if economic data keeps pointing to an improving labour market and rising inflation. That strengthened the expectations that the Fed could lift U.S. rates at its next meeting on Dec. 13-14, pushing the dollar to its highest since early 2003. Going forward, indications of a relatively balanced copper market next year could support prices.